PLDT Chief Technology and Information Advisor Joachim Horn introduces Smart's LTE-A service. Initially deployed in Boracay, Aklan, one of the country’s leading tourist destinations, Smart’s LTE-A service there has posted speeds of up to 250 Mbps. 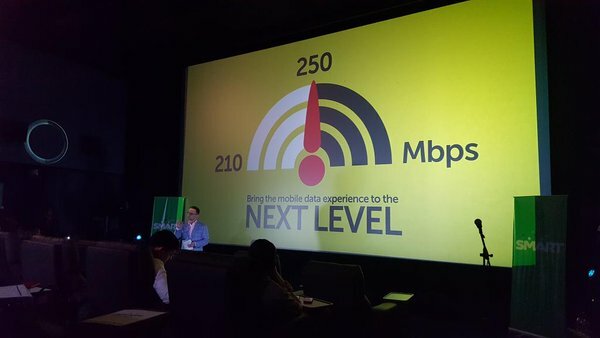 “With the introduction of our LTE-Advanced service, the next stage of development of 4th generation of mobile technology, Smart is again at the technology forefront, setting the bar higher for mobile service experience,” said Joachim Horn, PLDT and Smart chief technology and information advisor. Smart joins the short list of operators around the world that have tested and rolled out the technology, which is also referred to as 4.5G. This list includes Optus in Australia, Sprint in the US, and Turkcell in Turkey, among others. “Combined with our other network improvement initiatives for both our mobile and fixed line networks, the introduction of LTE-A will help boost internet services in the country and enable more Filipinos to enjoy and benefit from the fast-growing range of digital services that PLDT and Smart offer,” he said. “We are also planning ahead, in anticipation of future advances in technology. Our current investments in network facilities are already being done in a way that will enable us to be ready for 5G when it arrives sometime in 2020. For this purpose, we are working closely with NTT DoCoMo, which is one of the global pace-setters in the development of 5G,” Horn added. Carrier aggregation refers to the ability of LTE-A to combine two or more radio frequency bands in order to deliver bigger bandwidth and faster data speeds to mobile users. “This is like being able to put together two or more separate highways in order to create a wider highway through which vehicular traffic can flow more freely and at a much faster rate,” Horn said. “Wireless technologies being a shared resource, the actual customer experience is typically less than the peak speeds being registered during tests. But, carrier aggregation on LTE-A, by combining the capacities of two or more frequency bands, will enable Smart to deliver to subscribers with LTE-A devices consistently higher speeds than is possible using LTE. In Boracay, we have combined three frequencies, which is a first in the country,” he explained. For Smart subscribers using LTE-A capable devices, this translates into superior experiences when using various data services, particularly bandwidth-heavy services like video- and audio-streaming, and gaming. Currently, the LTE-A capable devices include the Samsung Galaxy S7 and the Samsung Galaxy S7 edge. Other handset manufacturers are expected to introduce their own LTE-A devices soon. Smart ran several tests of LTE-A in 2013 – in Boracay during the Geeks on a Beach startup conference; in Davao City during the Kadayawan festival; and in Makati City. The introduction of LTE-A capable devices since then has opened the door for its roll-out. Horn explained that LTE-A is the “cutting edge” of a broader effort to improve the cellular and mobile internet services of Smart and Sun subscribers. In a network integration program started last year, for example, Smart and Sun have been synergizing their networks to improve the coverage and quality of service for the subscribers of both brands using 2G, 3G and LTE capable devices. “For example, where it makes technical and marketing sense, we equip a single cell site – either of Smart or Sun – so that this can serve the subscribers of both brands,” Jorn said. As a result of this program, depending on the area, the effective coverage for Smart and Sun subscribers increases by anywhere from 50% to 100%. The program is expected to be completed by end-2016 or early 2017. This was part of PLDT’s P43-billion capital expenditure program (capex) in 2015 and will be funded by the 2016 capex budget which has been set at the same level. In this program, specific attention is being given to enhancing 3G/HSPA/HSPA+ coverage and capacity because about 90% of Smart and Sun subscribers who go online use 3G handsets. “Improving our 3G data service thus delivers immediate benefits to the largest number of people in our subscriber base. At the same time, we have been expanding the coverage of our LTE network because the number of subscribers using LTE phones is steadily rising,” Horn said. “And now, we have also begun to deploy LTE-A. The pace of this deployment will be driven by several factors, including the rate at which subscribers start using LTE-A capable devices,” he added.